Pastry shops here in the United States they use a special kind of ricotta called ricotta impastata, a very smooth, dry-textured ricotta made by pureeing well drained ricotta with very dry whey cheese. In Sicily, the ricotta commonly available is dry-textured enough to make a fairly firm filling on its own. Freshly made ricotta from an Italian grocery store is an adequate substitute, and sometimes such a store will even order you some ricotta impastata, if you can use the whole 10-pound package. If you have access only to the kind of ricotta available in the supermarket, drain it well in a strainer lined with cheesecloth or a wet paper towel set over a bowl in the refrigerator overnight. It’s also best to let the filling chill as long as possible to firm it up before filling the cannoli. Real cannoli filling is flavored with a drop of oil of cinnamon. You’ll need 8 or 12 cannoli tubes for frying the pastry shells. These are cylindrical metal tubes about 1 inch in diameter and about 5 or 6 inches long. They’re not difficult to find in cookware shops or department stores. If you are using the tubes for the first time, fry them briefly in the oil heated to cook the cannoli shells to season them and prevent the dough from sticking. Let them cool and wipe them clean with paper towels before using them. To make the dough, in a medium mixing bowl, combine the flour, sugar, salt, and cinnamon. Rub in the lard or butter by hand until it is finely incorporated. Whisk the egg, yolk, and wine together and use a large rubber spatula to stir the liquid into the flour mixture. Continue stirring until all the flour is evenly moistened and then scrape the dough out onto a floured work surface. Knead the dough briefly by folding it over on itself repeatedly until it becomes too firm and elastic to knead further. Use a bench scraper or a knife to divide the dough into 3 pieces. Flour 1 piece and pass it through the widest setting on a pasta machine. Fold the dough in thirds and pass it through again from the open side. Repeat until the dough is smooth and elastic and no longer shreds as you are putting it through the machine. Fold the dough in thirds again, wrap it in plastic, and repeat with the remaining pieces of dough. After all the pieces of dough have been passed through the pasta machine, fold each in thirds again, wrap them in plastic wrap, and refrigerate them for at least 1 hour or as long as overnight before continuing. To form the cannoli shells, remove the dough from the refrigerator and flour 1 piece. Pass it through the pasta machine open end first, as before. Decrease the size of the opening by two notches and pass through again, flouring the dough as necessary to keep it from sticking. Pass through every other setting, ending with the next-to-last setting on the machine. Place the strip of dough on a lightly floured work surface and cover it with plastic wrap. Repeat with the remaining 2 pieces of dough. Use a plain round cutter or a stiff cardboard pattern and the point of a paring knife to cut the dough into 4-inch disks. If using a cutter, slide a couple of folded sheets of parchment paper under the dough to act as a cushion. Cut straight down without twisting the cutter, which would seal the cut edge of the dough and make it puff up like a balloon while frying. Overlap the disks of dough on the work surface until you have cut them all. Roll over 1 disk of dough with a rolling pin to make it slightly oval. Position 1 cannoli tube lengthwise on the oval and draw 1 side of it up to the top. Carefully moisten about 1/2 inch of the top edge of the dough with egg white, using a brush. Make sure not to get any of the egg white on the metal tube or it will make the fried shell stick. Draw the other edge of the dough disk up to meet the first one and overlap them slightly. Holding the tube above the work surface to prevent pressure from cutting through the bottom of the dough, press the overlapped dough firmly together with your fingertips. Repeat with as many disks of dough as you have cannoli tubes. To fry the cannoli, in a large Dutch oven heat the oil to 375 degrees. Fry 3 or 4 cannoli at a time to a deep golden color. Drain them on one of the paper towel-lined pans. As soon as you’ve removed all the cannoli, immediately remove the tubes. (This must be done while the shells are still hot or they will contract on cooling and stick to the tubes.) Use an oven mitt to grasp the end of the tube and use a towel or several thicknesses of paper towel in the other hand to gently twist the shell off the tube. Return the shell to the pan to drain and cool. Repeat with remaining pieces of dough and tubes. If you only have a few tubes and need to reuse them, make sure to let them cool before wrapping more dough around them. While the shells are cooling, make the filling. Place the ricotta in the bowl of an electric mixer. Place the bowl on the mixer fitted with the paddle attachment and beat on lowest speed for 30 seconds. Beat in the confectioners’ sugar and continue beating just until it is absorbed. Beat in the vanilla and the cinnamon or cinnamon oil. Remove the bowl from the mixer and use a large rubber spatula to stir in the candied peel and the chocolate. To fill the cannoli, put some of the filling in a pastry bag that has a 1-inch opening at the end, but no tube. Squeeze filling into the shell from one end, releasing the pressure when the filing reaches the end of the shell you are squeezing from. Pull the pastry bag away in a downward motion to leave the filling straight against the end of the shell. Repeat with the other end of the shell. Repeat with as many of the shells as you want to fill at one time. Sprinkle the chopped pistachios on the filling at the ends of the shells. 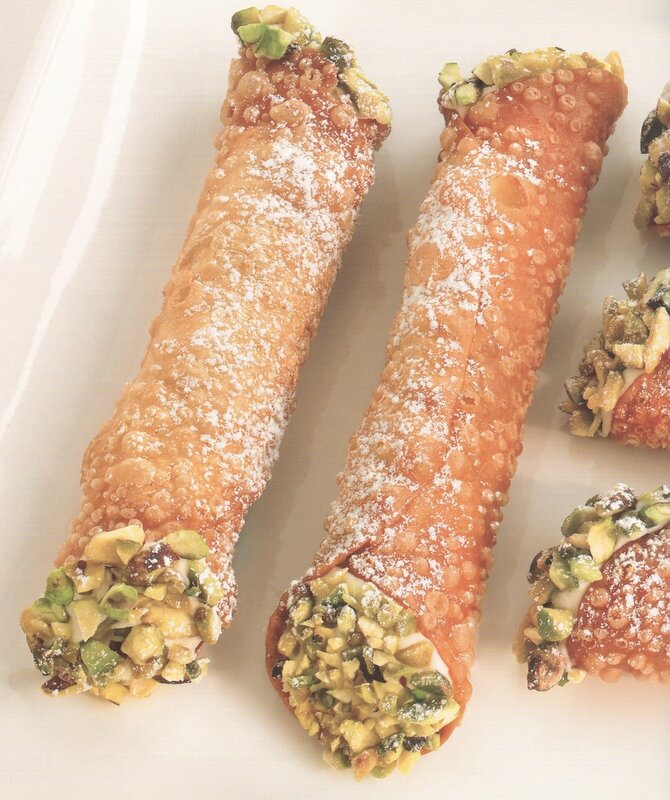 Dust the cannoli with confectioners’ sugar right before serving.